Located approximately 100 miles southwest of Atlanta in West Central Georgia and East Central Alabama, the Greater Columbus, Georgia Region is home to approximately 316,000 residents and an available workforce of 130,000 people. 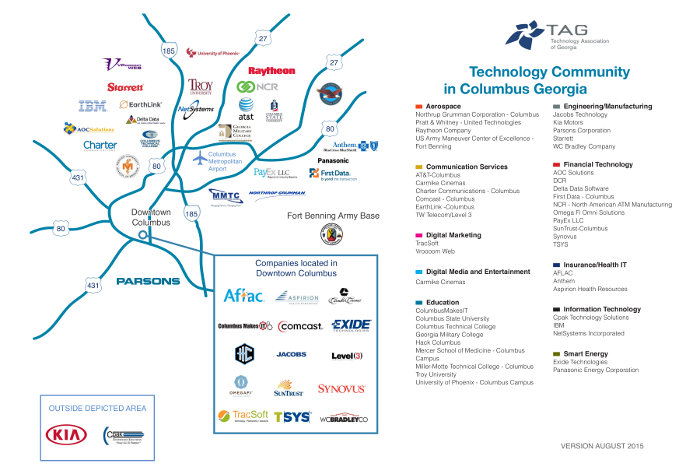 As an integral part of the Southeastern U.S. economy, Columbus is an emerging center for technology in Georgia. A number of technology and “tech-enabled” companies, colleges and startups are driving innovation in industries such as Aerospace, Financial Services, Health IT, Manufacturing and more.